A Southern California grandmother accused of a stabbing attack that killed a 1-year-old girl and wounded two other relatives is now in custody after a search that stretched on for hours, police announced Tuesday. 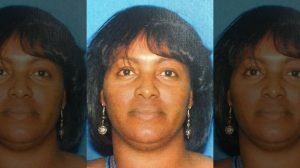 Nicole Darrington-Clark, 43, was the suspect in Monday’s attack that left her 1-year-old granddaughter dead and critically injured her daughter and 5-year-old granddaughter in Colton, about 60 miles east of Los Angeles, police said. After the attack, Darrington-Clark bolted from the apartment she shared with the victims, according to investigators. Neighbors who responded to the mother’s screaming pleas found the grisly scene and wounded children in the apartment. Police said they caught the grandmother in San Bernardino Tuesday morning. But a judge found Darrington-Clark not guilty by reason of insanity and sent her to a mental hospital.